I’ve been meaning to read something by Karen Lord for a while. For some reason, the fact that a group I participate in a lot on GR is reading one of her other books (which I also own) next month made me read this one. I won’t question it too much, because I enjoyed this a lot. It’s a short/quick read, and it’s different: it isn’t at all your run of the mill fantasy. I read it without knowing any of the background stuff about it being based on a Senegalese story, and I don’t regret that — instead of looking for the joining places between Lord’s story and the original story, I enjoyed the whole thing. It’s told fairly simply, in the style of a more or less oral narrative — there’s a conversational narrator, and the basic ideas are easy to lay hold of. I really enjoyed that it was in many ways a domestic story, with cooking and family at its heart. I also enjoyed that I didn’t guess every twist exactly right. Because of the fable/fairytale-like tone, I wasn’t looking for too much from the characters: the execution matches the form, while still providing likeable/pitiable who you can, to some extent, get to know. Still, if characters, setting, etc, really matter to you, then this might not be for you. I’m normally all about the characters, but this so perfectly hit my soft spots for a) something new and different and b) something that emulates another form well that I couldn’t resist it. I absolutely adored this book when I read it. I didn’t think there were any problems with characterisation. Yes, there was something a bit larger than life about them – but that suits a myth / fairy tale well. As far as I’m concerned, this is one of those rare books, along the likes of Stardust and Princess Bride, which make the adult me feel the way I felt as a kid hearing a bed time story: delighted, enchanted, comforted – without being a story that is childish / for kids. Agreed! Sometimes that doesn’t work for me, but I think Lord used the form really well here. Fantasy based on non-european myths is already a good sign. People’s idea of ‘fantasy’ seems to consist of solely of Nordic/Tolkien. Even fairy tale-inspired stuff is getting lost. There’s a lot more out there than people think, really. It’s just not marketed as heavily. 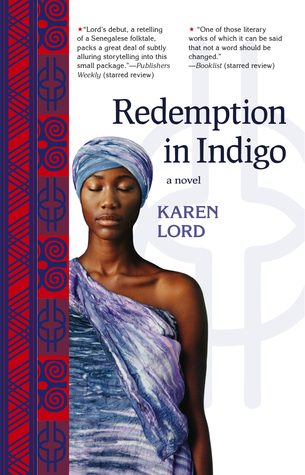 I read a sci-if book by Karen Lord last year and really enjoyed it! I’d like to read this one too. I think this one is better than The Best of All Possible Worlds, so I hope you do pick it up!